Calving ease is especially important in first-calf females, and is therefore something we pay close attention to when breeding virgin heifers. In fact, calving ease considerations usually rank first on the list when selecting bulls to use on heifers. Red Angus bulls often see service on heifers thus, mapping the relationship between calving ease EPDs (CED) and unassisted births is a worthwhile task. The better Red Angus breeders understand this relationship, the better selection and mating decisions they can make for themselves and their customers. The curved line shown in the chart below was statistically derived from tens of thousands of Red Angus calving records stored in the RAAA database. All of the calvings are from first parity females bred to bulls ranging from -8 to 20 for CED. This line captures the “average” or “typical” experience calving heifers as the sires’ CED goes from the low end to the high end of the Red Angus bell curve. 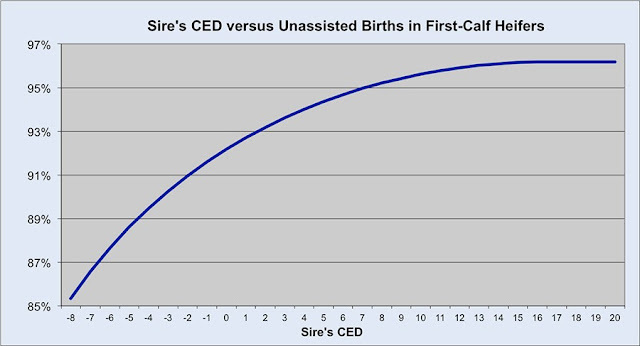 As expected, bulls with a higher CED produce a greater number of unassisted births. Conversely, bulls with low single digit or negative CEDs generally cause more calving difficulty. The shape of the curve also provides useful perspective. Note that moving from -8 to 0 for CED results in a sharp increase in unassisted births. That’s obviously a good thing. It’s also why we don’t see many heifers bred to negative CED bulls. Unassisted births improve further when moving from a CED of 0 up to the 8-10 area. This improvement is significant in magnitude, but the incremental benefit of each additional one-point increase in CED is now becoming smaller as the law of diminishing returns is taking effect. Moving up the curve from a 10 to 15 CED provides a bit more benefit but the incremental advantage is now very small. Over 15, the line flattens out completely, which means there is no practical difference in unassisted births for bulls having CEDs ranging from 15 to 20 or above. Unless a group of heifers are small in size, have inadequate pelvic area, and/or are underdeveloped at the time of calving, we would not expect any difference in calving difficulty between a bull with a CED of 14 or 15 versus one whose CED is 19 or 20. In that zone, the law of diminishing returns is in full control, stamping out any more benefit completely. As a final thought, don’t forget that EPD accuracies matter a great deal when making mating decisions in which calving ease is critical. It may in some situations be better to use a high-accuracy bull with a lower but still acceptable CED instead of one with a higher CED that is unproven with low accuracy. It is so easy to want to select for maximums. We need to remind ourselves to select for optimums. The Missouri Show-Me-Select Replacement Heifer Program requires Red Angus service sires to have a CED EPD greater than 8. Artificial insemination (AI) sires must have an EPD accuracy greater than 0.6.